A national Mexican holiday, Dia de Muertos, which translates to “Day of the Dead”, is celebrated every year in Puerto Vallarta in memory of those who have passed. The date lands on November 2nd, and is often confused with the traditional US holiday Halloween. The irony, though, is in the difference of celebration; Halloween represents fear of death whereas the Mexican holiday, Dia de Muertos, celebrates those who have already passed on. The celebrations begin on October 23rd and continue through November 1st (All Saints Day) and November 2nd (All Souls Day). 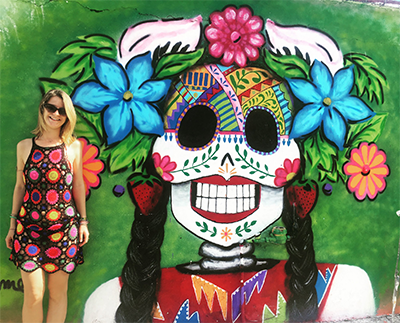 Halloween and Dia de Muertos are often celebrated together in Vallarta, creating a spectacular environment for people watching, street art & entertainment, and cultural displays of the holiday. The Day of the Dead has become the largest celebrated holiday in Mexico and has grown in popularity with the Hispanic communities in the United States. 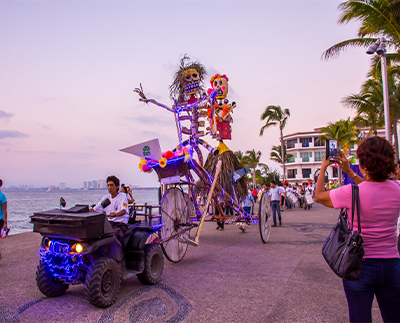 Puerto Vallarta offers a particularly spectacular opportunity to celebrate Dia de Muertos because of the open stretch of water in Banderas Bay, lined by the cultural displays on the El Malecon with a background of the lush, Sierra Madre Mountains. Included in this year’s celebrations will be art exhibitions, folkloric ballet, Mexican nights, mariachis, catrinas contest and the annual parade. The colorful parade will kick off the celebrations from the cemetery to the Malecon, the mile-long boardwalk that lines the ocean. The parade heads south toward the River Cuale market, with ballet dancers & mariachis performing for the cheering crowds along the way. Sayulita will be holding a special celebration this year, redecorating the streets in honor of the fishermen and surfers that were lost at sea. Expect the festival to begin on October 31st and go through November 2nd. A religious celebration will be held on November 1st followed by a procession from the church to the Pantheon, accompanied by celebratory mariachis. 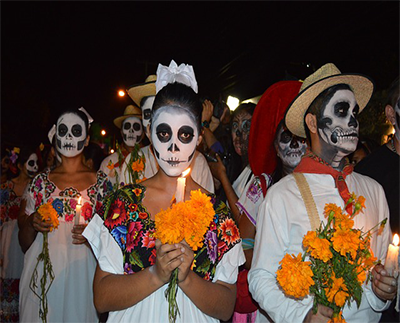 The Dia de Muertos celebration originated in Meixco prior to the arrival of the Spaniards. Records have been found of celebrations held in the Mexica, Maya, Purepecha and Totonaca ethnic groups. Their rituals celebrated the life of the ancestors and was carried out in these civilizations since pre-Columbian times. Among the pre-Hispanics, it was a common practice to preserve the skulls of their deceased and display them during rituals that symbolized death and rebirth. Death is not feared in Mexico, the dead are celebrated.